Fixed or Conventional Bridge – This is where one or two crowns are placed over the teeth to the side of the missing tooth. 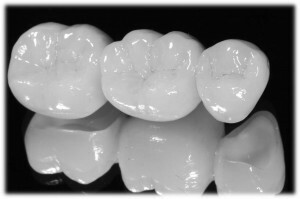 This may require some preparation of a minimum of one adjacent tooth however offers a more robust design. Maryland bridge/Adhesive Bridge – These again are attached to adjacent teeth however involve bonding a small ‘wing’ (or wings) to the real tooth. A major advantage of this is to avoid any preparation of healthy teeth and often this can be done without anaesthetic. 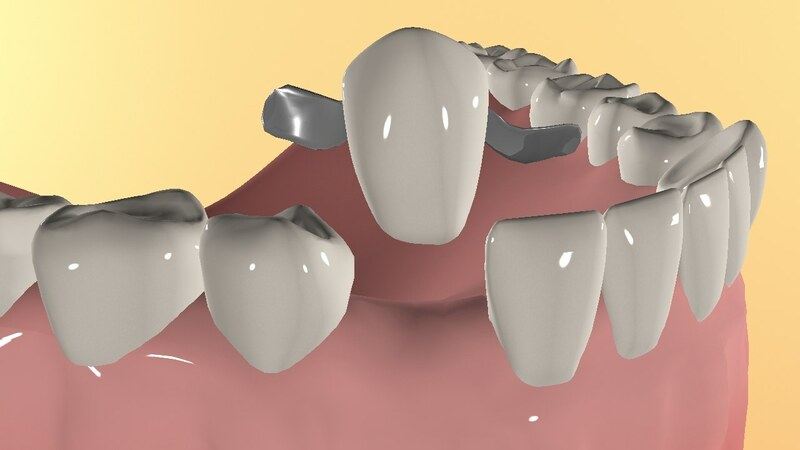 Although dental bridges can take 3-6months if planned after tooth extraction, the dentist is often able to make a temporary dental bridge whilst the area heals. The dentist will advise which bridge is best for each individual patient as some designs may not be possible or more likely to fail. In some cases dental bridges are not suitable at all. Private bridges will be able to offer metal-free highly cosmetic alternatives to less aesthetic metal-containing bridges. If you feel this may be the ideal option for you then give our team a call on ‘0141 445 1829’ or Book Online to arrange your consultation appointment. Your perfect smile, like the one below, may look the world apart with a dental bridge.